The toads were late to the garden party this spring but they’ve finally arrived and are croaking, mating, laying eggs–and filling their niche in the garden environment. I always think of the gelatinous strings of toad eggs as amphibian strings of pearls–and hopefully that mental image doesn’t put anyone off of wearing the real things. The Gulf Coast Toad or Coastal Plain Toad , Ollotis nebulifer (Bufo valliceps), is the likely species that laid these eggs-in-goo and soon there will be more toads for the croaking, mating, and egg laying. No doubt, some of the toads will make yummy meals for the resident Eastern Screech Owl, Megascops asio, parents and their 5 offspring. 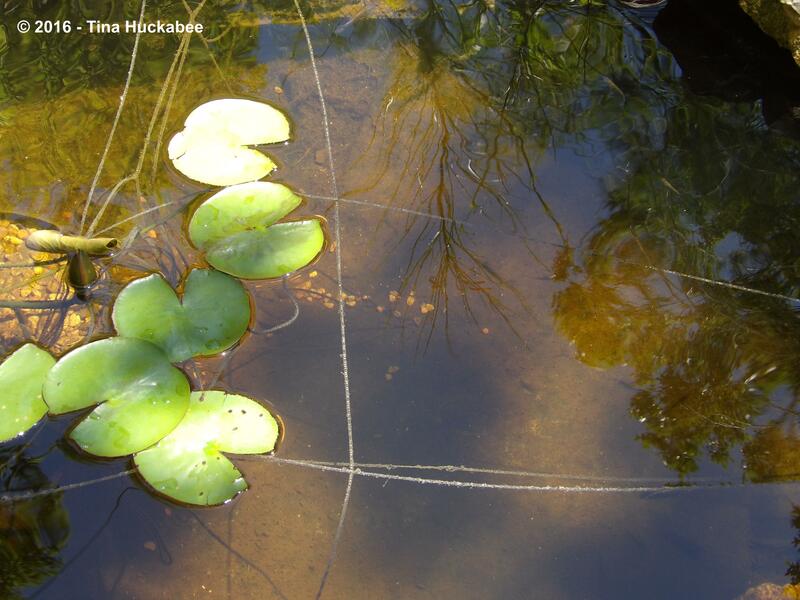 Along with toad eggs and fish, the pond hosts some handsome and varied foliage. I separated the ‘Colorado’ and ‘Claude Ikins’ waterlilies last month; both have since bloomed and very soon, will put on a rapid growth of lily pads, enough to cover about 75% of the pond surface by early summer. The pads serve as landing strips for bees and dragon/damsel flies, and occasionally butterflies. More importantly, the pads keep the water temperature even during the summer months, as well as cover and protect the fish as they swim underneath the pads. 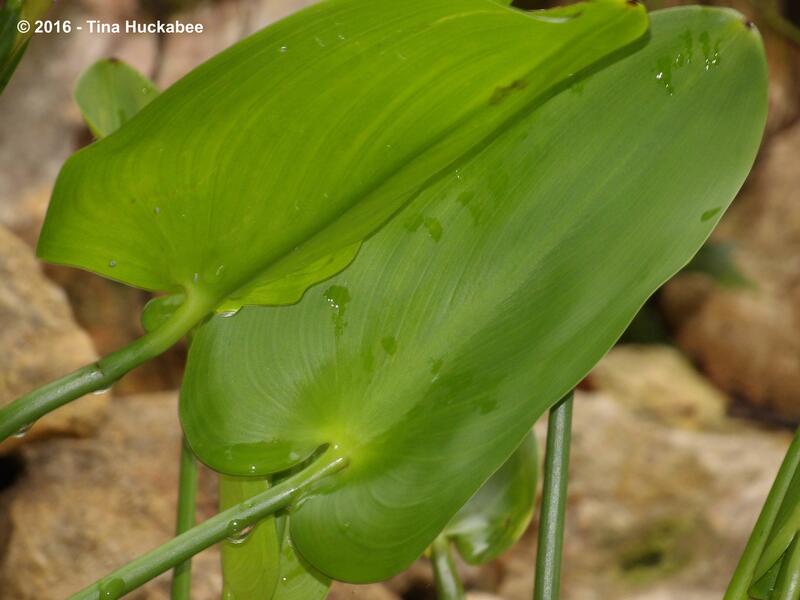 I also separated the Texas native Pickerel Rush, Pontederia cordata which grows in the bog. The open, moving water has given the birds, especially the little warblers and finches, a fun place to bathe. Every year, I promise myself that I’ll keep this assertively growing plant from filling in the bog–and every year I fail in achieving that goal. So this year is THE year: I’ll save some space in the bog for the birds to bathe–I’ll consciously weed out the Pickerel rush, even if it’s a weekly chore, so the birds can bathe in moving water. 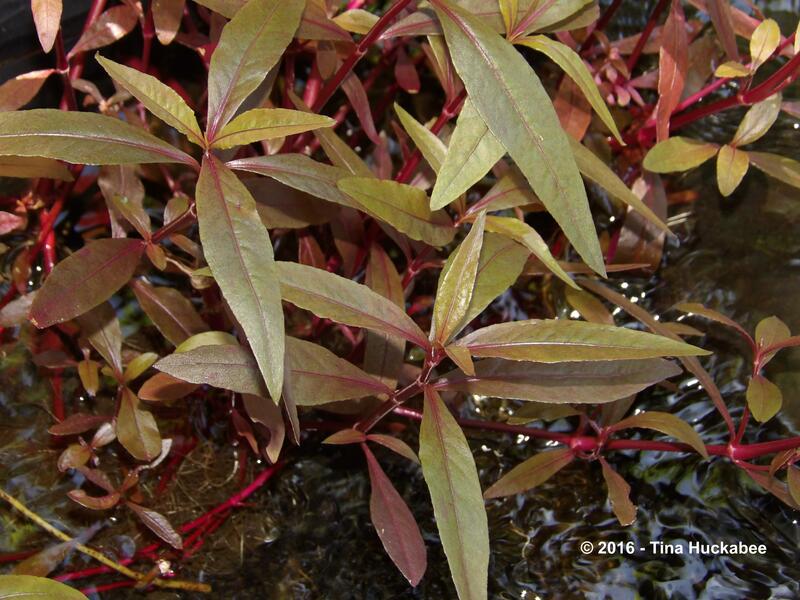 Another lovely and important pond foliage plant requiring yearly separation is the Ruby Red Runner, an Alternanthera hybrid that grows in the waterfall feature. 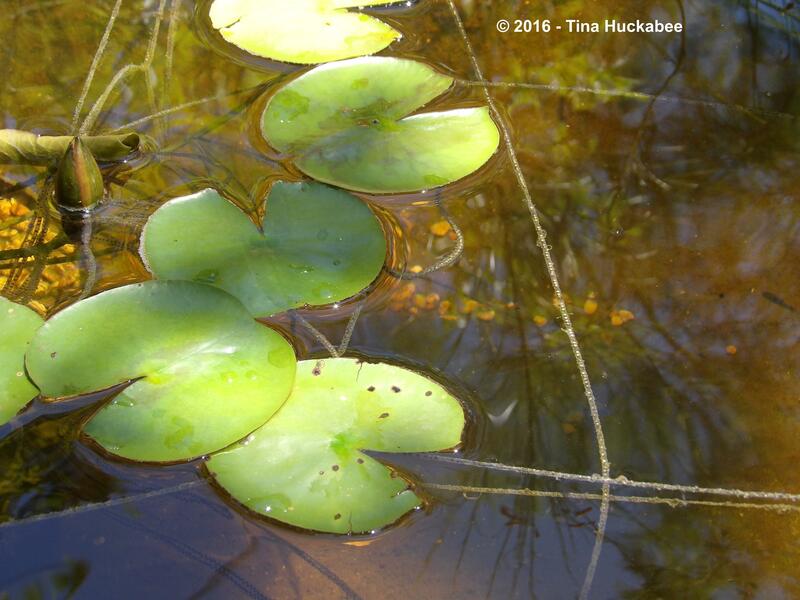 Like the Pickerel rush, Ruby Red Runner serves as a biological filter for the pond. Ruby Red Runner grows vigorously, sprawling all over the edges of the pond as the weather warms and the days lengthen. Taking in a wider view, I’m happy with the perennials which frame the pond. 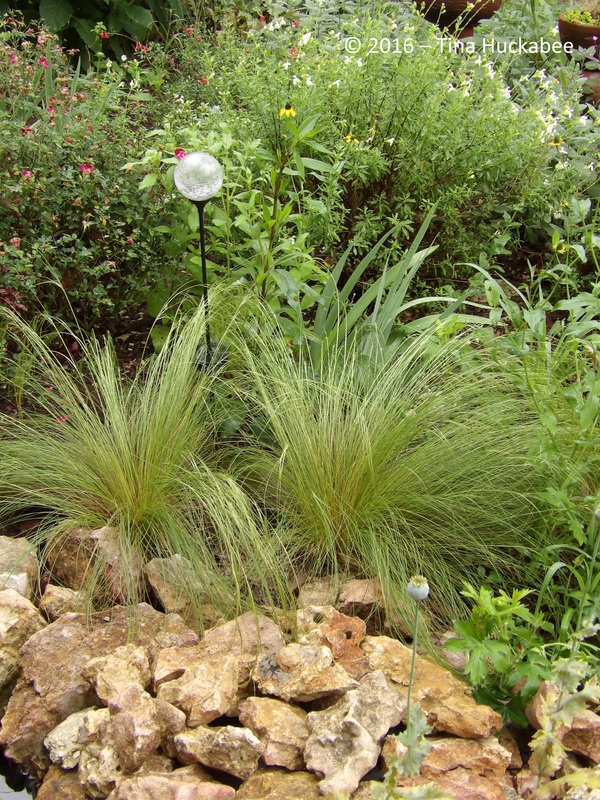 Across the pond from the perennial garden, is a pea gravel sitting area and pathway. 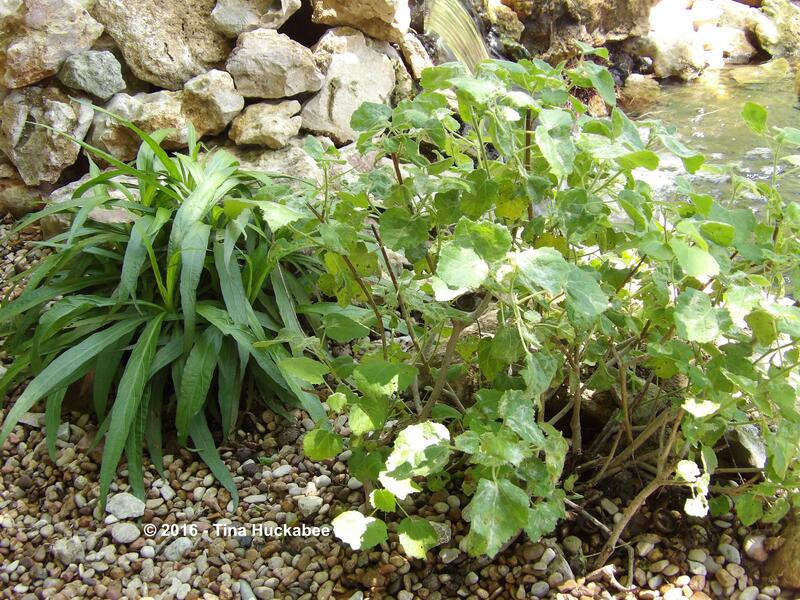 A Katie dwarf Ruellia, Ruellia brittoniana ‘Katie’, and a Rock rose, Pavonia lasiopetala, volunteered themselves for this spot and fit well beside the pond. These two neighbors sport opposite leaf types: ‘Katie’ is lance-like and deciduous and Rock rose is oval, scalloped, and semi-evergreen. 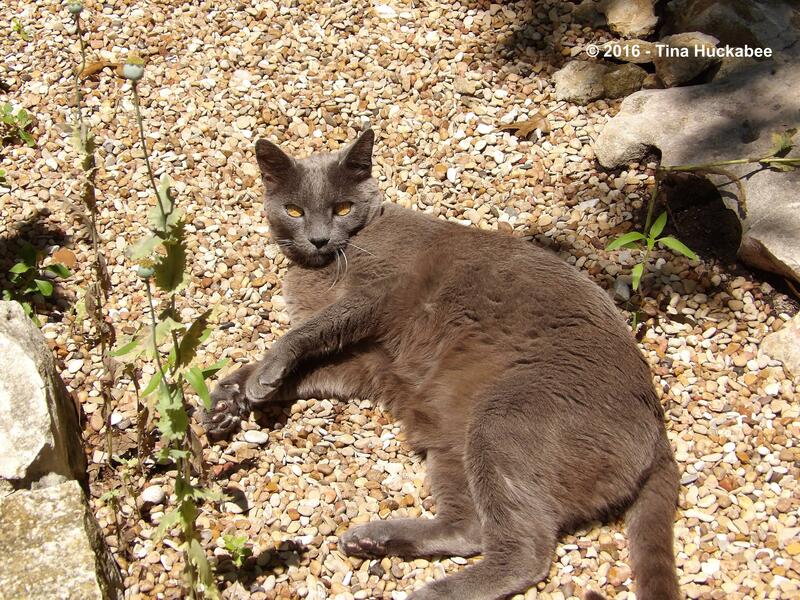 Nuri the Cat is comfy as he lies on the warmth of the pea gravel. Lazy cat. The evergreen Soft Leaf Yucca, Yucca recurvifolia, is a pup from the original, now-deceased mother plant. 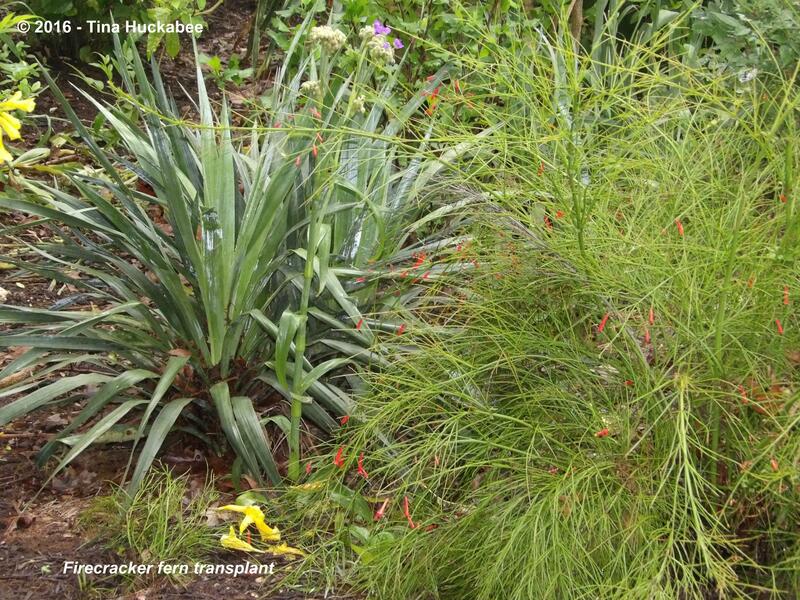 Just in front of the yucca, I recently transplanted some Firecracker fern, Russelia equisetiformis, that rooted out from the mother plant, to its right in the photo. It’ll be a couple of years before the transplanted Firecracker fern reaches maturity, but I think these two arching perennials paired side–by-side will be a nice addition to the garden and the pond. The mature Firecracker fern bloomed all winter during our non-winter winter, but is in a resting cycle now. The blooms of this plant are show-stoppers, but the foliage is also special: cheery, spring-green coloring pairs with graceful, arching stems and slender, elegant foliage. 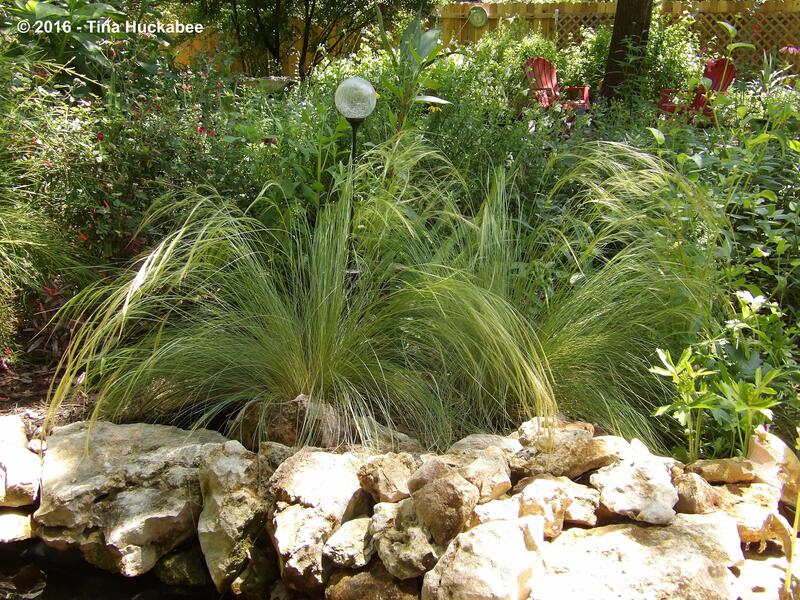 Mexican feathergrass, Nassella tenuisima–soft and silvery all year–is stunning in spring glory. 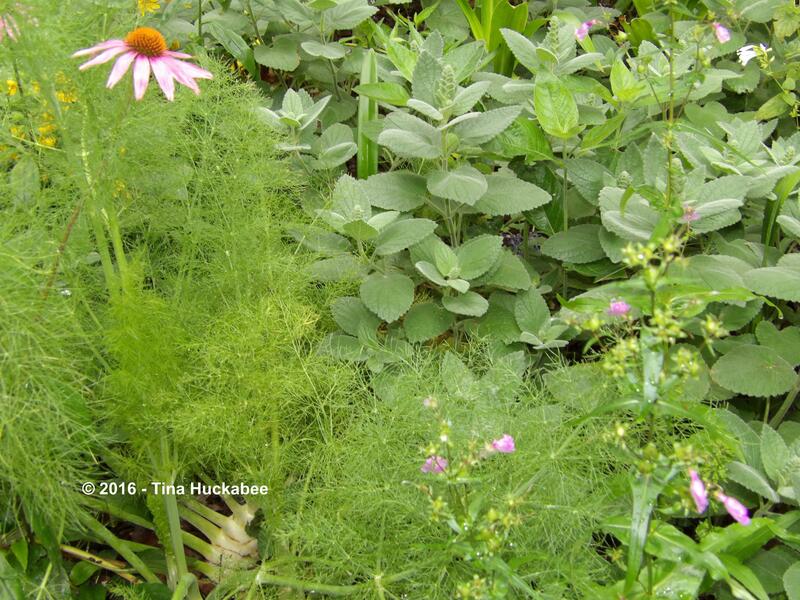 In the perennial bed bordering a different curve of the pond, a feathery, bright green fennel (planted for butterfly larvae), combines with grey-green Heartleaf skullcap, Scutellaria ovata. I guess it’s true that opposites attract. 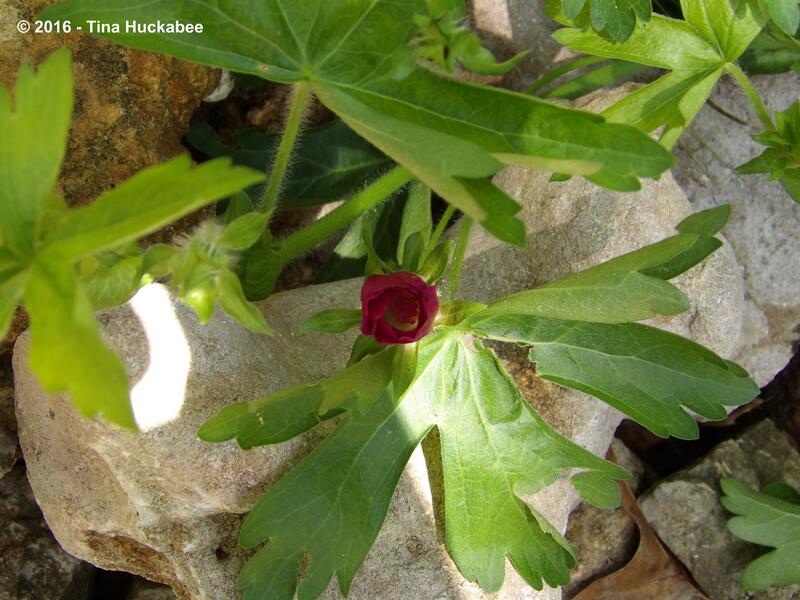 Nearby, Winecup, Callirhoe involucrata, clamors over the limestone rocks bordering the pond. Individual leaves of Winecup are lobed and hairy. Winecup grows as a ground-cover and spreads about 3 feet wide during the bloom season, which is beginning. Engelmann Daisy, Engelmannia peristenia, bursts with flowers next to more Heartleaf skullcap. The two flowering yellows are Blackeyed Susan ( left) and Engelmann daisy (right). Like the Winecup, the foliage of the Engelmann daisy is deeply lobed–another common name for this spring/summer daisy is Cutleaf daisy. Engelmann daisy is an excellent pollinator plant, the blooms attracting a large variety of native bees, flies, and butterflies. Celebrating foliage in the April garden, many thanks to Christina and her lovely Creating my own garden of the Hesperides. 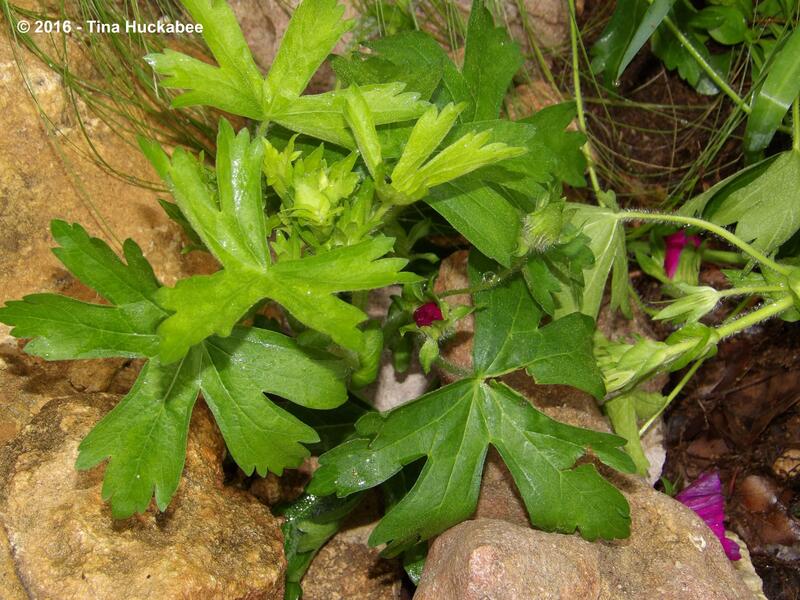 Check out her Garden Bloggers’ Foliage Day for a look at foliage in many gardens, from many places. 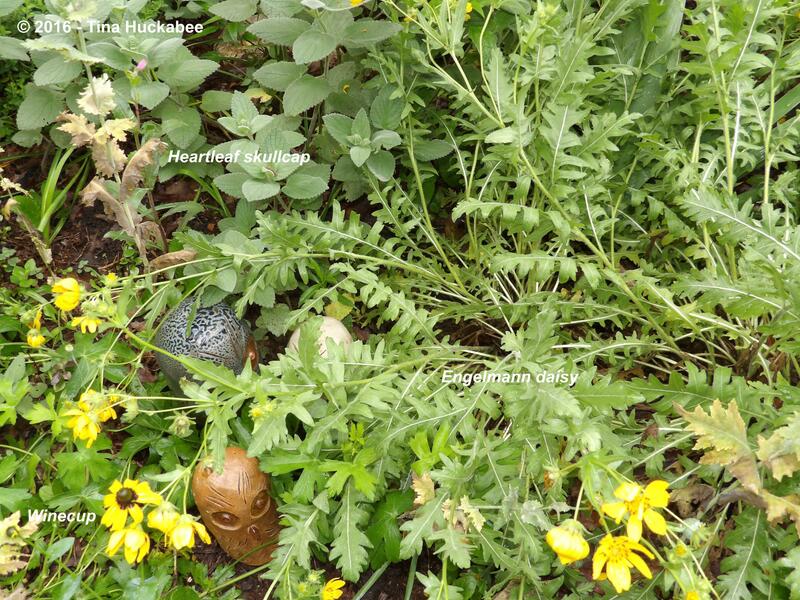 This entry was posted in Engelmann Daisy, Firecracker Fern, Foliage in Texas garden, Katie dwarf Ruellia, Mexican Feathergrass, Pickerel Rush, Pond plants, Rock Rose, Uncategorized, Winecup and tagged Garden Bloggers' Foliage Day by Tina. Bookmark the permalink. Fascinating that your frog population seems to be running “late” while so much of the rest of our local garden plants are appearing and/or blooming early this year. And how very brave that you’ve publicly announced your pickerel rush thinning intentions here…we’ll be watching, lady…we’ll be watching. I know you’ll hold my trowel to the fire…or water. 🙂 I love the bog as it fills in with plant material, but those birds–they have so much fun in the water and it’s such a kick to watch them. It is interesting that the toads were late this spring, especially with the mild temps and that everything else is early. Even the first year that the pond existed, they showed up immediately; we finished the pond in the first week of March and had it up and running and the toads were croaking within about 7 days!! I love your pond. Do you have any problems with predators taking your fish? Thanks! Yes, the fish get visited and sometimes eaten by Great Blue Herons and Green Herons–everyone has to eat. I can tell when there’s been a visitor, because there are usually some misplaced rocks and the fish are all huddled at the bottom of the pond. This is the time of year where they’re most vulnerable to the gullet of a big bird because the lilies aren’t covering the width of the pond surface. All that said, I only have gambusia (little native mosquito fish) and a few goldfish, no koi for me–they poop too much and make a mess. 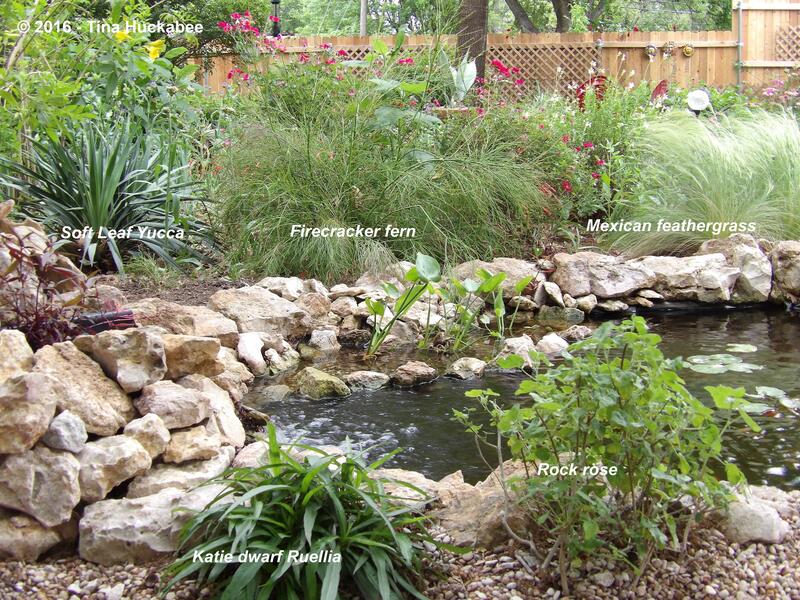 I donated my koi to Zilker Botanical Garden’s Japanese pond some years ago and they’re very happy there, so I’m told. I would like to see a Heron in my yard. I thought maybe your lilies would provide cover. The lilies are great cover for the fish–once they’re grown in, that is. It’s quite something to see the big Herons in the garden. Two weeks ago, I walked out onto the back patio, heard a clattering on the roof, and a HUGE heron lifted his wings for take off!! We surprised one another. They’re very shy, those herons and I’ve yet to get a good photo of one hanging out at the pond’s edge. 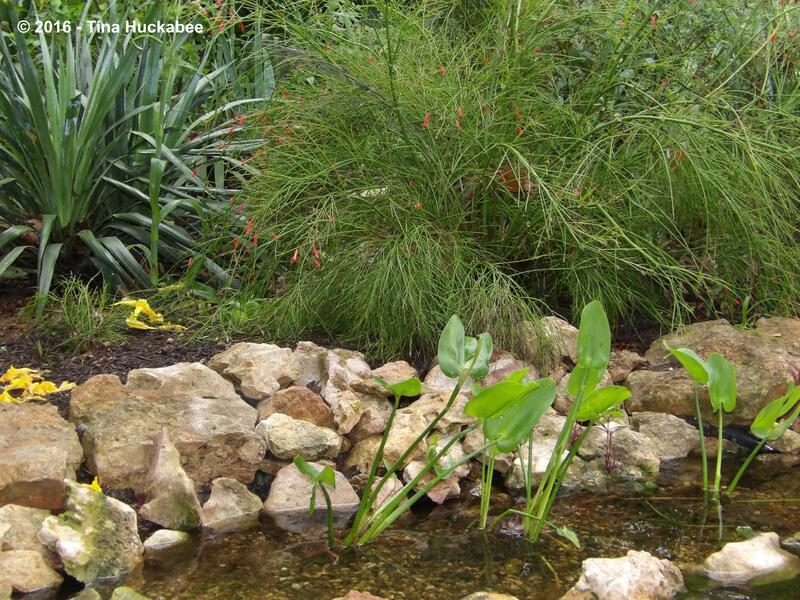 Great choice of emphasis on the importance of shade plants for ponds for your contribution to GBFD this month. 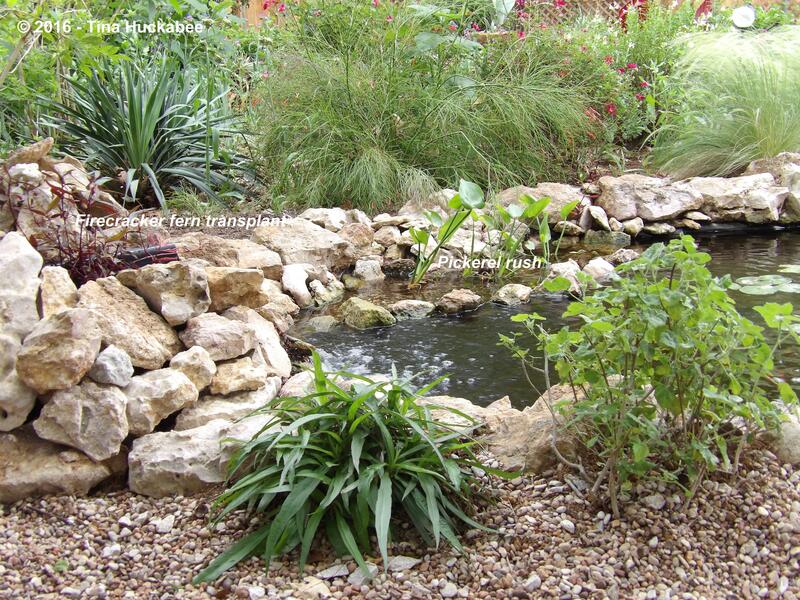 Your pond is beautifully planted and looks very natural, never easy, well done. Thanks for adding your Texas foliage to the mix. You’re most welcome, Christina. I’ve enjoyed the pond in the garden;my only regret is that I didn’t build it sooner. A lovely post, interesting to read and lovely images. Garden ponds are amazing aren’t they? We have toads in our garden but I have never seen their strings of eggs in our pond… only clumps of frogs eggs. Thank you, Gillian. I’m so glad to have a pond–I don’t think I could ever NOT have one. I’ve had frogs in the pond, but they never reproduced. Your pond is really lovely Tina, a real oasis. How do the fish and toads survive together? Love the planting too. Thanks, Julie! As far as I know, the fish and toads are best buds. 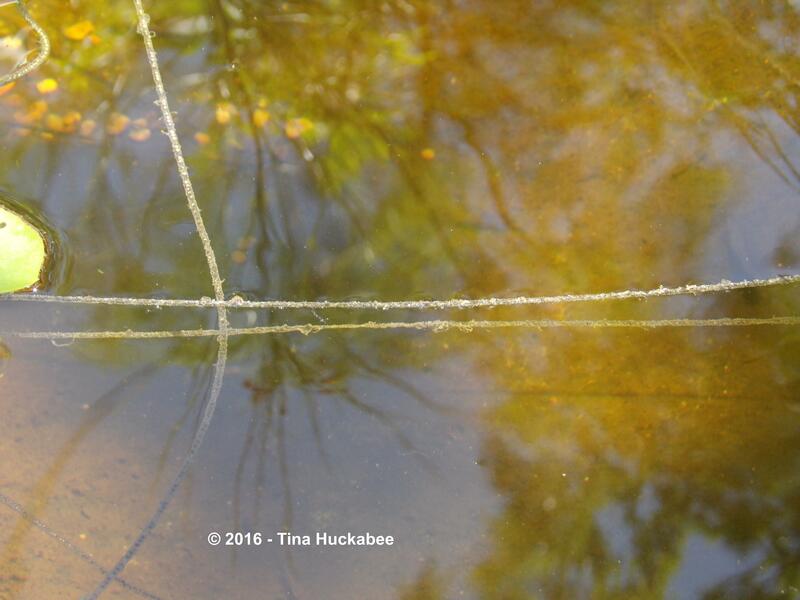 I imagine that when the toad tadpoles are really small, that the fish eat them–it’s what they do. But other than that, I think they live side-by-side quite well. They both scatter when the herons show up and definitely when the owls hunt at night. Thanks, Jenn. I do hope you’ll enjoy your little pond community. I haven’t found the pond to be much work–occasional filter clean-out, which only takes about 10-15 minutes, and there’s the one long day (usually, late Feb) where we remove the fish, drain the pond, clean it out, and cut back most of the plants. But, that’s only one day/year. We always order pizza afterwards…. Ha! You gotta watch out for that corgi, to be sure. I think the critters living in and around the pond are happy ones! All of your garden is lovely, but I think I’d love hanging out at the pond the best. There seems to be so much happening there—toads, fish, birds, insects, and more. I would be entertained for hours! Thanks, Tracy. It is a nice respite and great place to wildlife-watch. I’ve never regretted building the pond. Thanks–we’ve enjoyed all of the critters-n-plants. Oh dear, Tina, I thought I’d commented before, I had meant to! Lovely to see your toad strings of pearls.. I’ve thought of them like that myself, too, though I’ve not seen a toad for several years where we live now. Here we usually have huge numbers of frogs in the spring and then we have a pond absolutely heaving with tadpoles, but unfortunately several mallard ducks decided the spawn was very tasty and I think we’ve lost nearly all of them. 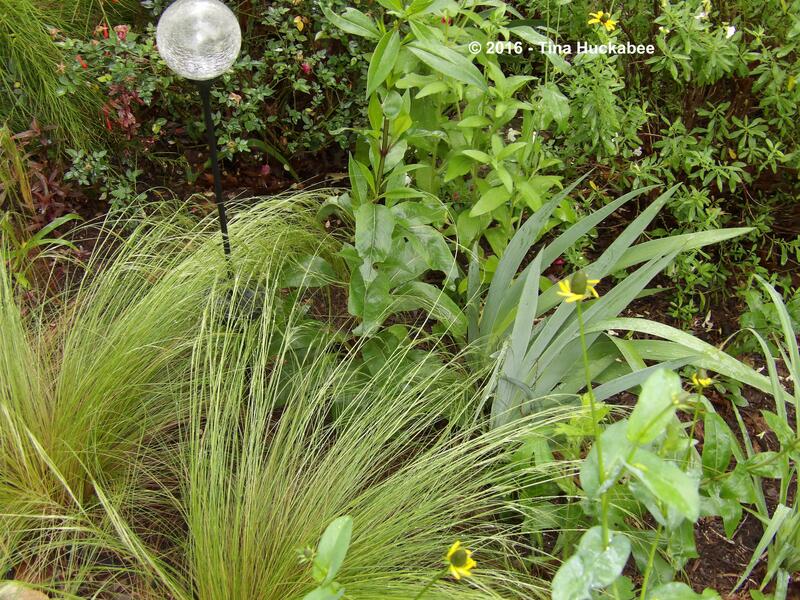 For a moment, looking at your photos, I thought I was looking at parts or our garden (yard) as we have the same solar lights in the same sorts of plants! No problem, Val. Funnily enough, I have some tree frogs (I hear their chirps) but I’ve never seen any in the pond. Of course, that doesn’t mean they’re not actually in the pond. As for the similarities in gardens, well you know, great minds….